I haven't posted lunches in a while and part of it is just the End-of-School-Year-Craze. We are moving at the end of the school year as well and with concerts, picnics, and special summer school days, there hasn't been much time to sit down and blog. 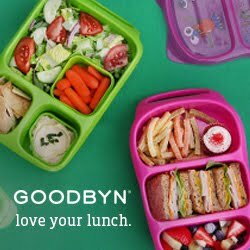 We have 12 days of school left and I challenged myself to make lunches fun again and blog. Two and a half more weeks and then summer vacation, pool time, beach visits and a move are in my future and I am trying to savor the last days of our school year routine. and Applegate sandwiches on a stick. I have to say, I am really proud of him for picking different foods. I love the Crispy Green apples and since they don't add anything to the fruit, I can be sure they are not loaded with sugar. My kids love the current Minion promotion from Mott's and even though there is added sugar in these, I am letting them indulge in the new summer flavor. If you freeze the apple sauce over night, they will be ice cold and refreshing at lunchtime AND keep your lunchbox cold! This lunch for middle school is nearly identical to the one above - brothers always want what the other has, right? - and packed in Easylunchboxes as well. We added some delicious Applegate Provolone to the sandwiches on a stick and he picked the Crispy Green tangerines over the apples. and a Mott's tropical Minion apple sauce. Are you switching things up for the last days of school? Let me know what you pack to keep the kids happy in the last few days before summer!